Every April the Alice Ferguson Foundation's Potomac River Watershed Cleanup hosts events throughout Maryland, DC, and Virginia to clean up our Nation's river. 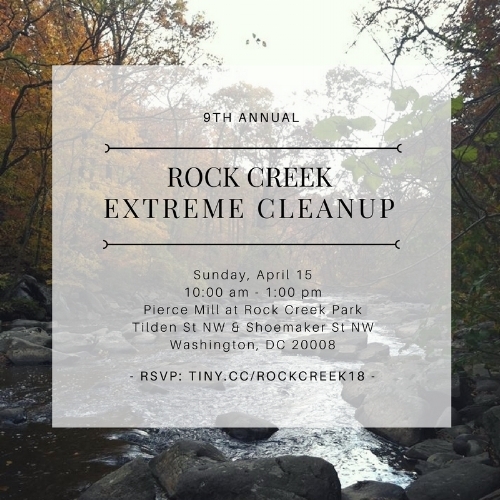 This year WAN will be joining Blue Planet Scuba and the Rock Creek Conservancy for their 9th Annual Rock Creek Extreme Cleanup this Sunday, April 15th at 10 a.m.! Volunteers will clean-up the lands, banks, tributaries, and waters of Rock Creek and surrounding neighborhoods where the trash originates. We will also be celebrating World Fish Migration Day with programs offered on fish migrations in Rock Creek Park. We will meet at Picnic Area #1 near the intersection of Tilden Street NW and Shoemaker Street NW. Limited parking is available, but Cleveland Park and Van Ness metro stations are both about a 15-minute walk away. Can't join us on April 15th? The Alice Ferguson Foundation is hosting numerous events throughout the month of April. Cleanups will be conducted the length of the Potomac River from western Maryland to its mouth at the Chesapeake Bay. A list of volunteer opportunities can be found here.